You will read a dozen reviews of this week’s episode of How I Met Your Mother that try to copy Bedtime Stories’ rhyming scheme. I won’t stoop that low. Unlike those other sites, I’m going to hold our recaps to a higher standard. I can’t be distracted by some gimmick or … oh wait. This is the website that gets a large amount of its monthly traffic from GIFs of Robin dressed up in a Tomb Raider costume. Nevermind. In all seriousness, Bedtime Stories will go down as one of HIMYM’s most creative episodes, fueled by a rhyming scheme that ran the entire episode and must have taken a ton of work from the show’s writers. On that level, great job, HIMYM writers. It’s nice to see that you’re still finding new ways to present stories about this group of friends that we’ve now hung out with for over eight years. On a storytelling level, though, Bedtime Stories was just another filler episode. Season 9 of HIMYM has given us several flashbacks, with most of them revealing secrets about the gang’s past. A few episodes ago, a flashback episode showed us how The Mother played a huge role in getting Barney to go after Robin. Those are the kinds of flashbacks we need. We’ve seen Barney pick up random girls or pretend to be members of the New York Yankees before. The show shouldn’t be using valuable time during its final season to repeat those stories. At the end of the episode, Marshall said two things to Marvin. The first was as Marvin finally drifted off to sleep as Marshall remembered the good times he used to spend with his friends at MacLaren’s. “Feels like a lifetime since those days,” he muttered. Yes, it does feel like a lifetime since those days. Thankfully for fans of the show, we can turn on half a dozen channels, turn on Netflix or pop in a DVD to relive those days of HIMYM. For Marshall, though, those days are long gone. After Robin and Barney’s wedding, he’s either moving to Italy or dealing with the aftermath of Lily finding out he accepted a judgeship. The young, carefree Marshall that we once knew is gone. Hopefully HIMYM has a solution to this dilemma, since I really, really don’t want Marshall to go out on this note. With his boardgame- and Loch Ness Monster-loving ways, Marshall has always been the jubilant spirit of the show. Of course, this spirit made watching him deal with his father’s death all that much more difficult, but in the final season of HIMYM, I don’t want to see a Marshall who dreads what lies in store for him when he finally reunites with his wife. That’s not the Marshall we love. Is there a line that sums up this season more perfectly? After eight years watching HIMYM, fans believed that the show would deliver on the promises it had made over almost a decade. That belief was heightened more in Season 8 with the reveal of The Mother, adding Cristin Milioti to the show as a full-time cast member. Those promises haven’t been fulfilled, and despite Milioti’s standing, she’s only shown up for a few quick moments this season. This journey has been a bummer. TV shows, especially ones with such devoted followings as HIMYM, are tricky things. The more a show asks its fans to become invested in its characters and the story it’s telling, the more those fans feel as if they have ownership over the show. HIMYM is Carter Bays and Craig Thomas’ creation. They have the right to do whatever they want with its final season. If taking the gang away from their familiar surroundings, giving Marshall an awful storyline by himself and showing The Mother as little as possible is the way they want to go out, that’s their choice. It’s a sad choice, though. So how about the episode itself? Bedtime Stories took place during the rehearsal dinner (yup, Marshall missed it), as Marshall and Marvin rode a bus to Farhampton. 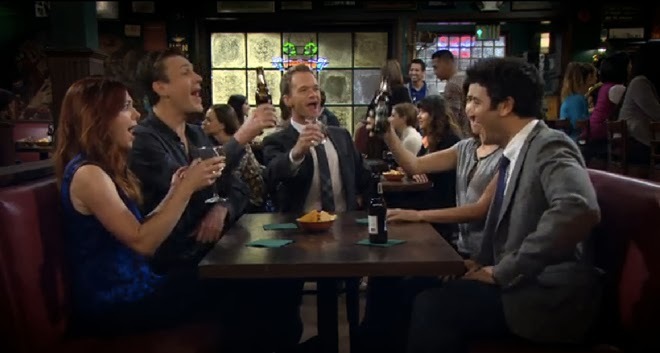 We’re finally rid of Daphne, but according to a TVLinereport on Monday, Marshall won’t be reunited with his friends until the Dec. 19 episode of HIMYM. It turned out that Marshall and Lily could only get Marvin to fall asleep with the rhyming lyrics of Mother Goose stories, and after Marshall left Marvin’s book in the rental car, Big Fudge had to turn to making up his own rhymes. Marshall told Marvin three stories, Mosby at the Bat, Robin Takes the Cake and Barney Stinson: Player King of New York. I’m not quite sure where the stories played in the HIMYM timeline, since Barney wasn’t dating Robin at the time, Ted was single and Marshall couldn’t remember if Robin had just broken up with Kevin, Scooby or Gael. We could be looking at anywhere from Season 3 to Season 7. Ted’s story saw him trying to figure out if he was on a date or a work dinner with a fellow professor. This segment introduced the International Date Line, a new theory from Barney. While it did turn out that Ted was actually on a date, the date was ruined when Lisa, his date, showed him the picture of herself with Derek Jeter, a former date. 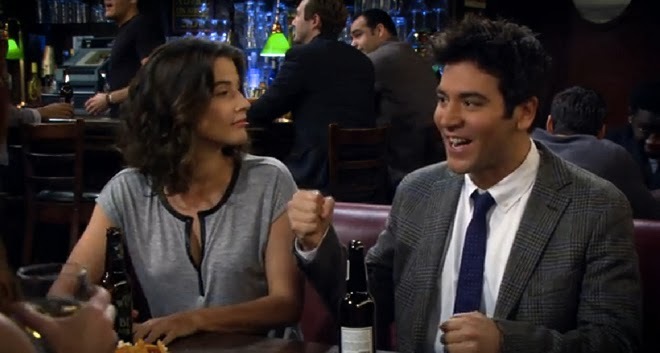 If you’ve been watching HIMYM for awhile, you guessed pretty early that it turned out Lisa didn’t date Jeter — she dated Barney pretending to be Jeter. The highlight of Robin’s story was a cameo by James Van Der Beek, returning as Simon, Robin’s former Canadian boyfriend from her days as Robin Sparkles. When Robin learned that a cleaned up Simon was engaged, she stole her ex’s wedding cake and ate the entire thing. And finally, Barney’s story centered on the ridiculous tale of how he poisoned the other members of the High Council of Players and became the player king of New York City. My biggest question about this segment: If there was an entire council of guys who look almost exactly like Barney, why did Lily have so much trouble finding Barney’s doppleganger? At the end of the episode, the bus to Farhampton broke down. Once Marshall learned that the inn was only five miles away, he decided to walk the rest of the way. Cue Marshall Vs. the Machines, the song from the Season 6 episode Subway Wars. I’m blaming Daphne for Marshall losing Marvin’s Mother Goose book. Still the worst. Marshall: “The outlook wasn’t brilliant for Ted’s romantic life. Gus, the guy on the bus Marshall was talking to, pointed out that the stories Marshall was telling Marvin were kind of crass for a kid. HIMYM then cut to a shot of Ted’s kids on the couch. HIMYM — not caring about telling children inappropriate stories since 2005. At least Ted’s kids scolded him for this in that awesome Comic-Con video. Robin: “I have a cake. What have I done? The world will not forgive it. This day will live in infamy. I never shall outlive it. For I have become the girl that eats her feelings, don’t mistake it. Shouldn’t it have been Lily loudly eating chips as Robin tried to focus on finishing Simon’s wedding cake? The Season 3 episode Spoiler Alert showed us that Lily was the group’s loud chewer. Barney’s annoying habit was overusing catchphrases. The Council of Players was made up of Barney, Staten Island Lou, Tuxedo Charlie, Pickle Jar Bob, Bronx Donnie and Captain Bill. Like I said before, how did Lily never run across a real Barney doppleganger?